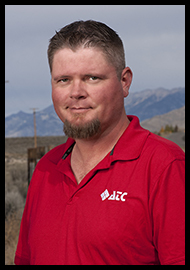 Jake was born and raised in Arco, and came to work for ATC in the fall of 2012. Taking care of customers is Jake’s primary focus; he has a rare gift of relating to people in all walks of life. His light-heartedness, infectious sense of humor, and down-to-earth mentality crowns him our “Interpersonal Expert”. As a bonus, Jake also brings electrical wiring experience to the table, where his knowledge base is often relied upon during troubleshooting and installation. Jake loves to cook, and is famous for his home-smoked meats and strawberry chipotle BBQ sauce. Jake also enjoys fishing, ATV riding, and outdoor activities with family and friends. We’re thankful to have this patient, charismatic communicator on our ATC team.